A recent visit to the local zoo renewed my interest in the giraffe. Upon seeing that long necked, uniquely patterned animal walking gracefully around its habitat, I was awed by its beauty. It stopped and looked at me. I snapped its picture. For a moment in time this creature and I connected. What was it thinking when it stopped to look at me? Was it admiring me ? Was it wondering, as I was, why our necks were so different even though each of us had the same number of bones in them? Obviously, the seven bones in my neck were surely very different from the seven bones in the giraffe’s neck. As the tall creature moved on and went back to eating a lunch of leaves from the nearby Acacia tree, I marveled at its patchwork coat. What a beautiful design God had worked out for the giraffe to wear. I felt humbled as I thought about this and all of God’s creation. Each animal, plant, rock, tree, bird, etc. are uniquely designed. What a pleasure it is for me to be able to see each one and learn about its special quality. A visit to the zoo is always inspiring for me. 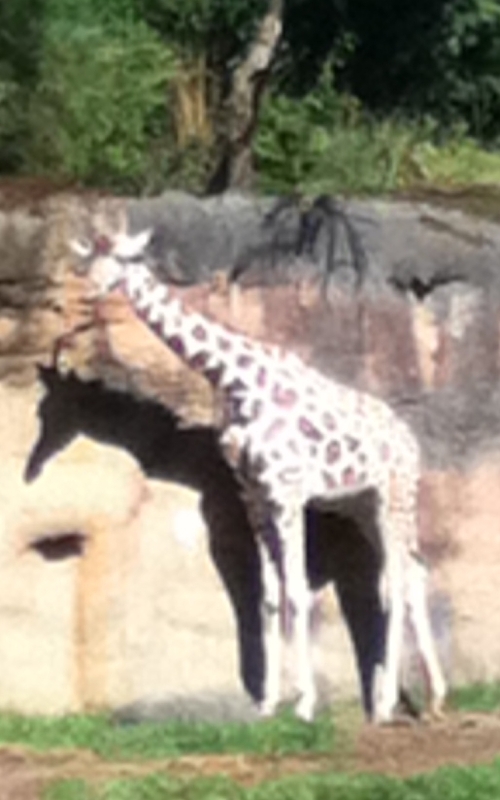 Giraffes are the world’s tallest animals. Males actually reach 18 feet in height. They move so gracefully on their long legs one would never guess they could weigh up to 4200 lbs. Most of a giraffe’s day is spent eating as they need up to 75 lbs of food per day and it takes a lot of leaves to do that as they only get a few in each bite. Their long tongues have a special coating which allows them to eat the thorny leaves of the Acacia tree. This adds to their uniqueness as it is something most animals can’t do. As I was doing internet research on giraffes I found many interesting and unique facts about them. Actually San Diego Zoo has a fun. fact filled page on Giraffes that I enjoyed reading, but I also came across one website that really caught my attention. It was found at www.giraffe.org and I read “This nonprofit honors the risk-takers, people who are largely unknown, people who have the courage to stick their necks out for the common good, in the US and around the world.” It is a place where people are invited to become involved, to stick their necks out, to become giraffes. On this site you will find: a Giraffe Heroes Database where you can search alphabetically for Giraffe Heroes worldwide and the Criteria for Giraffedom , which gives the principles one can use in nominating someone to be a Giraffe Hero. There is also Shop Giraffe that has information on the K-12 Giraffe Heroes Program. This is a very interesting and inspiring organization and one I definately plan to check out further since I feel my world could always use another hero or another giraffe in it.